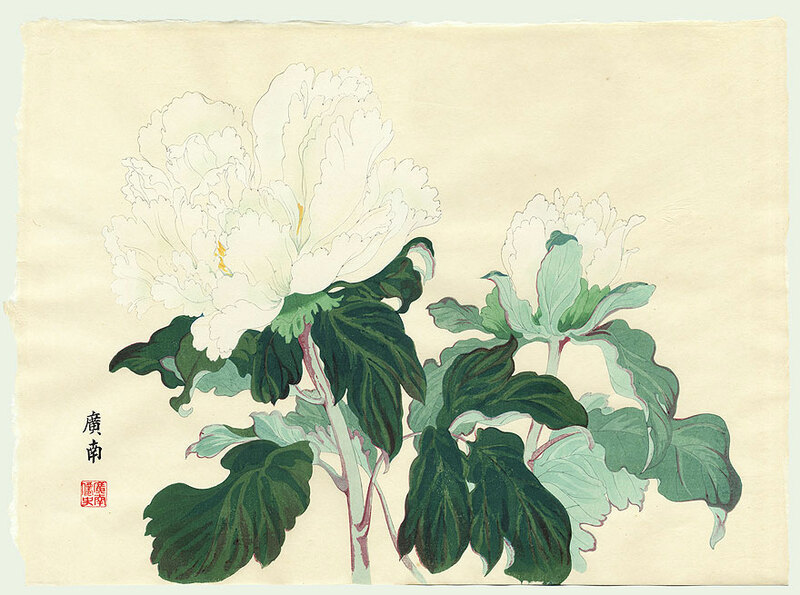 As in China, tree peonies are commonly depicted in traditional Japanese art. 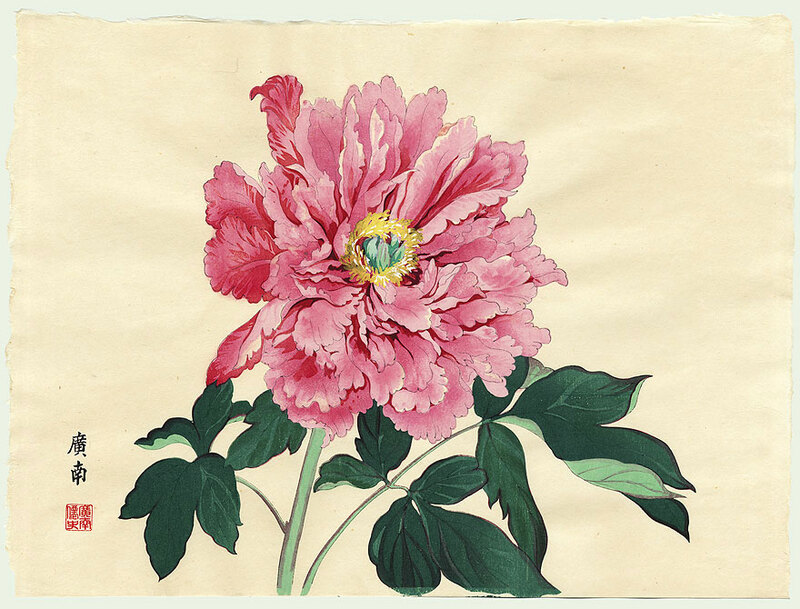 In Japan, tree peonies not only represent feminine beauty, but also wealth and nobility of spirit. 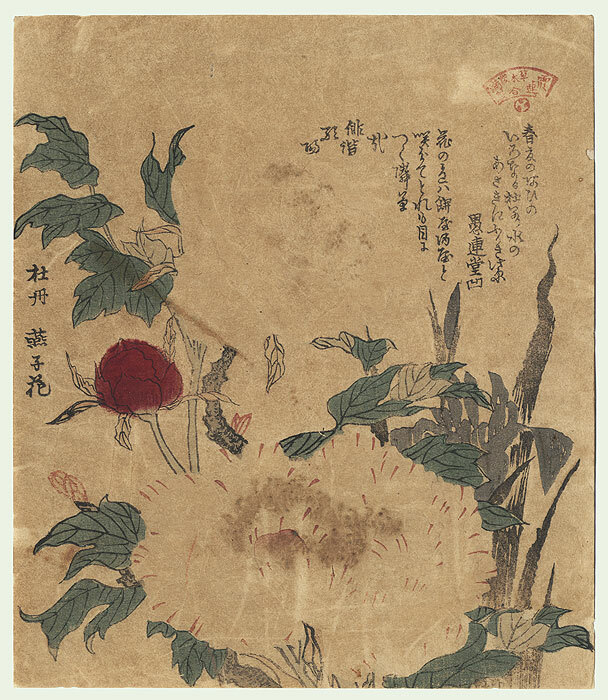 We have assembled a selection of images demonstrating how the tree peony is used as a common motif across a range of traditional Japanese art forms; from woodblock prints to tattoos. The most famous genre of this art form is ukiyo-e 浮世絵 literally “pictures of the floating world” which began in the 1600s. 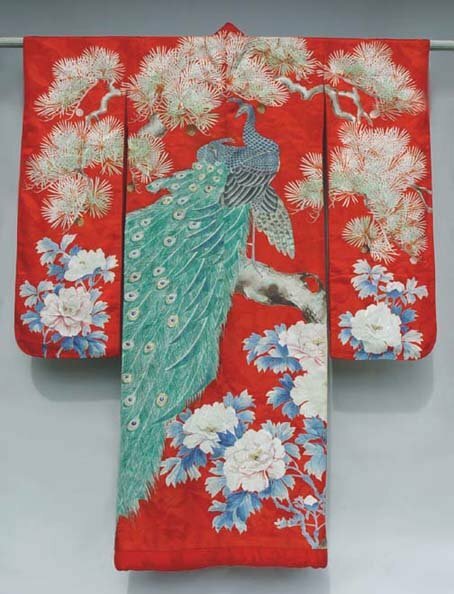 This sophisticated form of woodblock printing developed in Edo or Tokyo and was patronized by a growing middle class. The style which developed for woodblock prints also spread to other forms of printing including silk screening for fabric and paper. 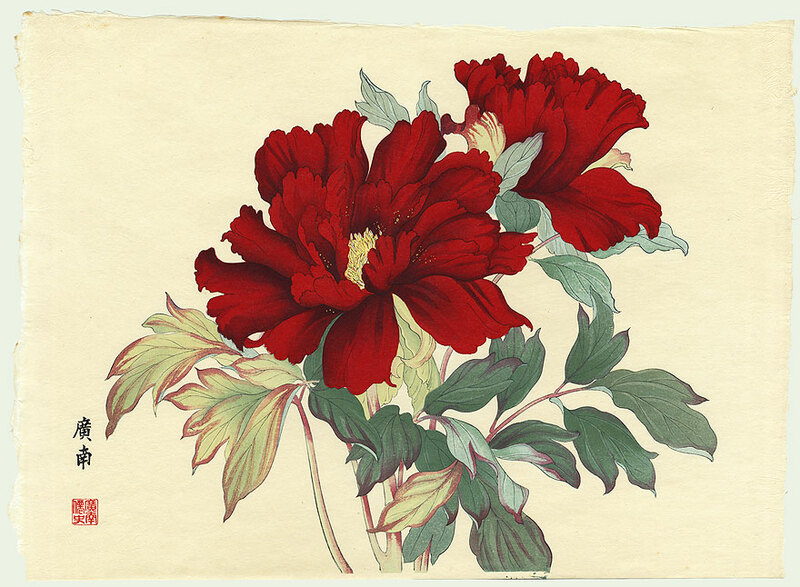 The following prints come from series Peonies by Tanigami Konan for the Imperial Exhibition of 1917 in Tokyo. 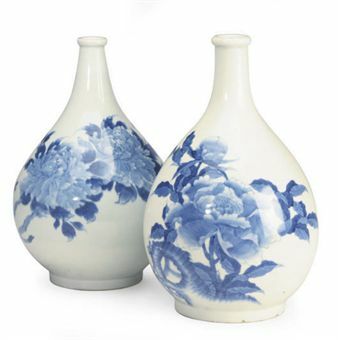 Each depicts a famous named tree peony variety of the time. Unfortunately, in the source I found, they are not labeled. 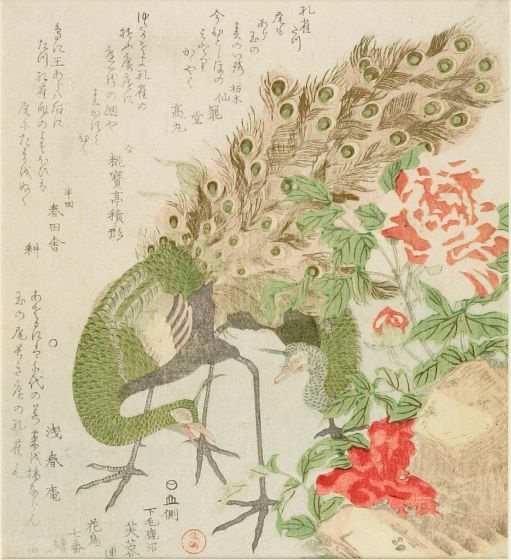 Dragon and Peony Kimono, from the series Six Selected Famous Actors by Toyohara Kunichika 1873. This is a 20th century uchikake or silk wedding kimono. Contemporary chiyogami paper from Osaka, Japan. This art form, like many others in Japan, originated in China. In the 18th century screens became popular in residences of samurai where they conveyed high rank and demonstrated wealth and power. 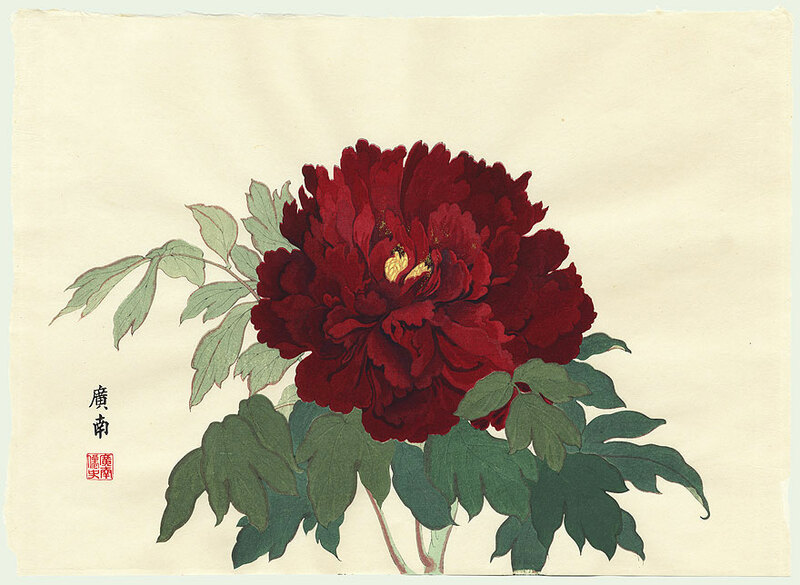 Peonies Botan zu fusuma by Kano Sanraku, 17th century, screen with gold-leaf background. 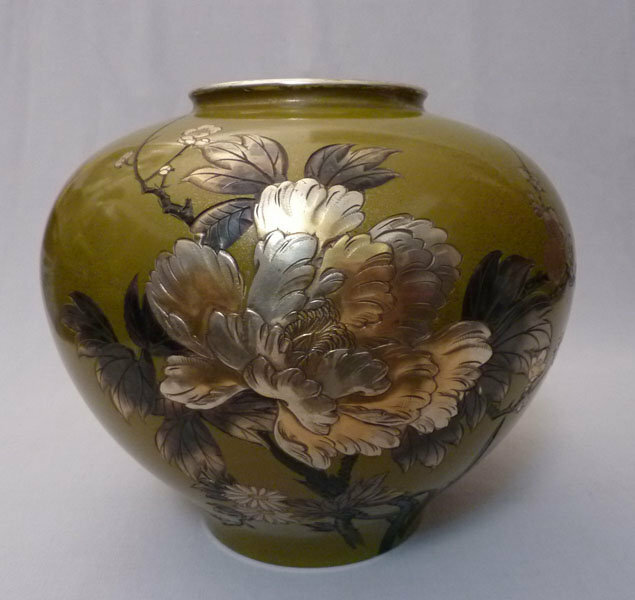 19th painted ceramic vase in the Arita style. This 19th century bronze vase is inlaid with silver and copper. 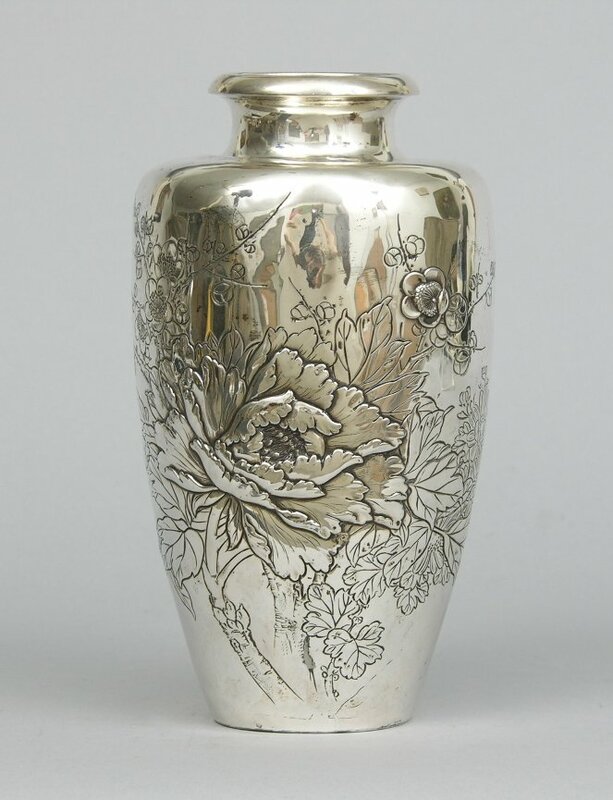 This early 20th century vase is made of solid silver. 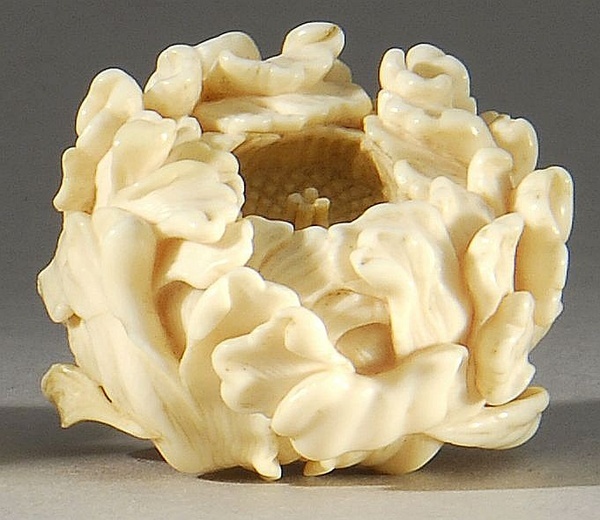 These miniature carvings are often of ivory and originally served as sash fasteners for pouches and containers. 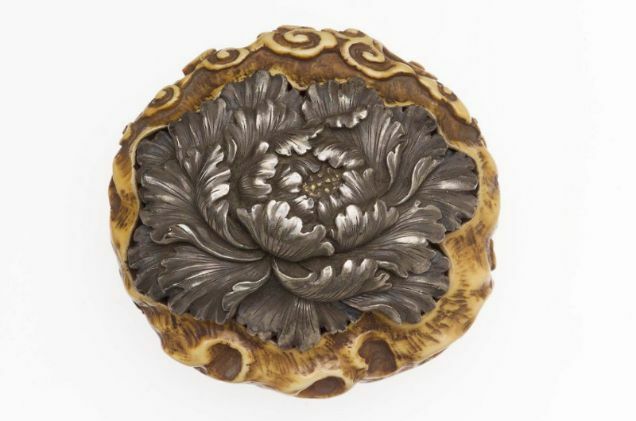 This is an example of Kagami netsuke, or netsuke with metal inlay which dates from the late 19th century. For much of Japanese history, tattooing was taboo in Japan, and reserved as a punishment for criminals. 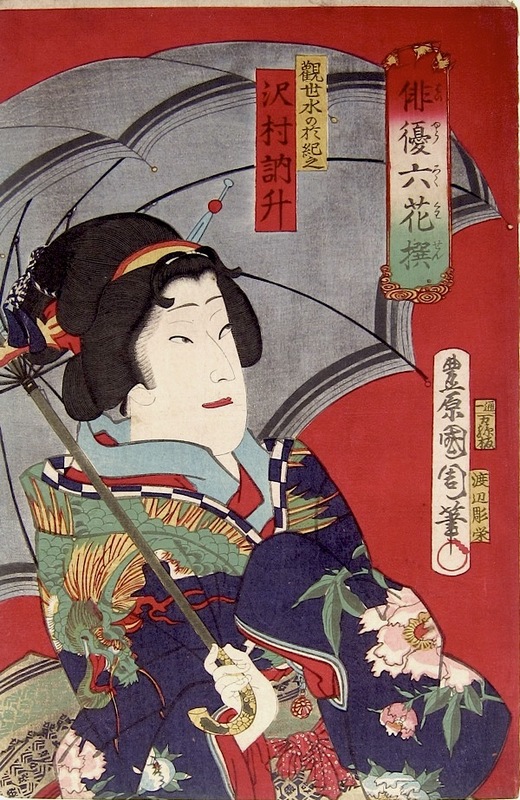 However, in 18th century Edo, as Tokyo, was then known, the development of sophisticated woodblock printing techniques paralleled the rise of a tattoo culture. 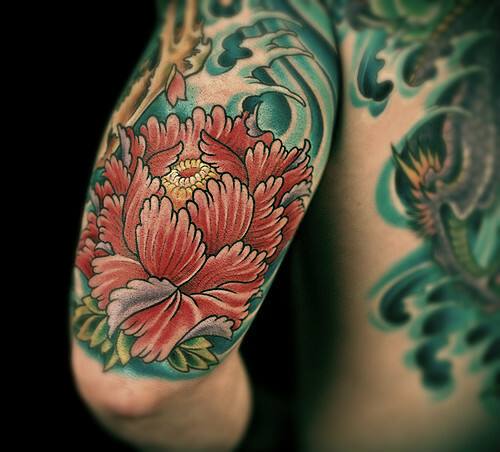 Marginalized members of society favored tattoos as did the Yakuza, or mafia. In the mid-19th century there was again a government crackdown against tattooing of Japanese citizens. It was during this time that Japan began large scale trade with Western powers. Ironically, during this period Japanese tattoo art flourished, the clients being foreign sailors. It was not until after World War Two that tattooing was legalized in Japan. Today it is still viewed as somewhat taboo. 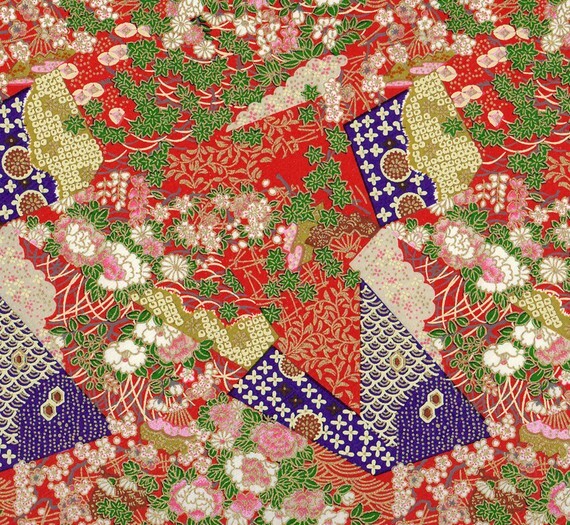 The designs used are simplified adaptations of woodblock print . 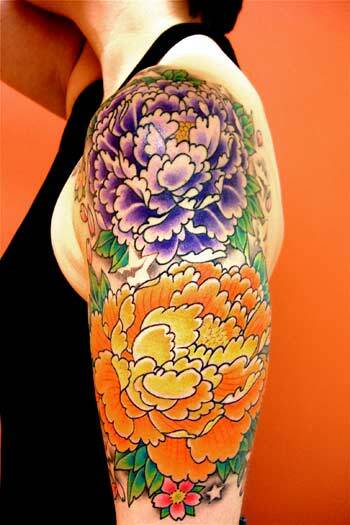 Tree peonies are common motifs in Japanese tattoos. Imagine showing this beauty off at your next garden club meeting!